Many religious ceremonies have included sacrifice, the act of giving up something of value and offering it to a deity. Worshipers may make a sacrifice to win the favor of the deity, to give thanks, or to maintain a good relationship with the god. Myths from around the world contain many examples of sacrifices in which animals, humans, and even gods shed blood or die. Sometimes the sacrifice is linked with creation or with the continuation of life on earth. People also make offerings of precious items such as flowers, wine, and incense or a portion of the fruit or grain collected during a harvest. 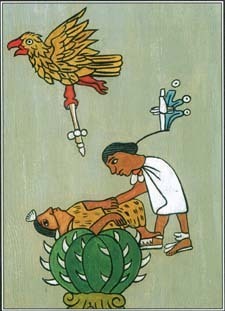 One type of sacrifice, which was practiced by the Aztecs of Mexico, involved blood offerings to feed the gods. Aztec priests conducted elaborate ceremonies of human sacrifice. practice of blood sacrifice was based on the belief that life is precious, even divine. When freed from an earthly body, life returned to its sacred source. In ancient Rome, a person performing a sacrifice said to the god, "Be thou increased by this offering." The idea behind this type of sacrifice was not pain, suffering, or death. Rather, life was being returned to the divine world so that the gods, in turn, would continue to give life to the human world. Other theories provide different explanations for blood sacrifice. One suggests that it began as a form of magic. Another says that sacrifice may have been viewed as a symbolic meal that the community shared with its deity or as a reenactment of creation myths. Still another tells that sacrifice may have been seen as a way of focusing and controlling aggression within the community. Hunting peoples generally sacrificed game animals, while herding and farming peoples used domestic animals such as sheep, goats, chickens, and cattle. Certain types of animals were regarded as the most appropriate sacrifices for particular purposes or for particular deities. Dark-colored animals, for example, might be offered to deities of the underworld, while an all-white animal might be seen as the best gift for a sky god. The sacrifice of humans has been known in many parts of the world. There is also evidence that in some communities animals were eventually substituted for human victims. The method of slaughter generally involved either blood (flowing freely or offered in a ceremonial vessel), fire (to carry the sacrifice to the god), or both. Sometimes, however, the person to be sacrificed was strangled, hanged, or drowned. A special person, such as a ruler, priest, head of household, or older member of the community, usually supervised or carried out the sacrifice. The sacrifice was made in front of a group—it was too important an act to be performed privately Special rites, such as ceremonial bathing or fasting, often accompanied the sacrifice. The sacrificial offering might be placed on an altar or before a statue of a deity or burned in a sacred fire so that the smoke would carry its scent to the heavens. Mythic Sacrifices. Many creation myths involve self-sacrifice by gods or primal beings. In an early Hindu myth, Purusha is the primal being who allows himself to be dismembered so that creation can take place. His eye becomes the sun, his head the sky, his breath the wind, and so on. Purusha became a symbol of the acts of sacrifice that kept the cosmos stable. The mythology of the Aztecs of central Mexico told how two of the gods formed the universe by splitting a goddess in half, so that one part of her became the sky and the other part became the earth. The Aztecs performed large-scale, violent rites of human sacrifice as a way of repaying the goddess and the other deities for the violence and sacrifice of creation. In Norse* mythology, Odin, the chief of the gods, made a kind of self-sacrifice by hanging on the World Tree Yggdrasill for nine days to gain magical knowledge. For this reason, the Norse sometimes sacrificed war captives to Odin by hanging them, and Odin became known as the god of the hanged. Sacrifice is often an act of worship or obedience. In the book of Genesis in the Bible, God tells Abraham to take his son Isaac to the top of a mountain and sacrifice him. Abraham builds an altar and prepares to sacrifice his son when a voice from heaven tells him to stop, saying, "Now I know that you fear God, because you have not withheld from me your son, your only son." Turning around, Abraham notices a ram caught by its horns in a bush. He releases Isaac and sacrifices the ram instead. Some myths present sacrifice as a way of setting right the relationship between people and gods. The Kikuyu people of Kenya in eastern Africa tell of a time when no rain fell for three years. The crops dried up, and the people asked their magician what they should do. After performing a magical ceremony, he told them to bring goats to buy a maiden named Wanjiru. The next day everyone gathered around Wanjiru, who began to sink into the ground. When her family tried to help her, those around gave them goats, so the family let her sink. As Wanjiru sank inch by inch into the ground, rain began to fall. By the time she disappeared into the ground, the rain was pouring down. Afterwards, a young warrior who loved Wanjiru went to the place where she had disappeared. Letting himself sink into the underworld, he found Wanjiru, brought her back to the surface, and married her. Sacrifice may be linked to divination, or foretelling the future. The Druids* of ancient Britain sacrificed both animals and humans in the belief that they could read the future in the victims' dying movements or in the patterns of their intestines. In the story of Sunjata, told by the Mandingo people of Mali in West Africa, a king sacrificed a bull to acknowledge a prophecy. A hunter predicted that if the king agreed to marry a hideous young woman, their child would become a great ruler. In Central America, the Mayan Vision Serpent ceremony—held to consult with the dead and determine the future—included offerings of blood drawn from the king. See also Aztec Mythology ; Druids ; Odin ; Sunjata ; Yggdrasill .